George Costanza: "My life is the opposite of everything I want it to be. Every instinct I have, in every part of life, be it something to wear, something to eat … It’s all been wrong." 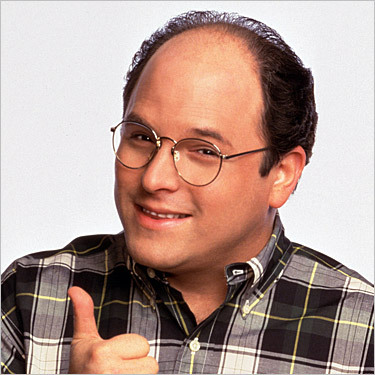 In a classic episode of Seinfeld called The Opposite, perma-loser George Costanza comes to the realization that if he would just act completely contrarily to his own instincts, things would begin to go his way. Jerry Seinfeld: "If every instinct you have is wrong, then the opposite would have to be right." One cannot help but see the parallels between George’s epiphany and the paradox of the high beta market rally that has left even the most experienced players in utter disbelief. *AIG ($AIG) barely avoids liquidation – buy it and enjoy percentage gains in the thousands! *Unemployment remains at around 10%, inital jobless claims are still climbing – so buy some specialty or even luxury retailers! *Mortgage rates are inching higher and housing has not truly bottomed – so snag some Hovnanian ($HOV), some lumber names and why not a little Home Depot ($HD). *Oil breaks out above $85 – and the airlines go wild! *Congress passes a de facto takeover of Healthcare – OMG! Healthcare stocks are rallying on the news of their newly subjugated status! *Commercial RE is a time bomb – REITs! I gotta have more REITs! We can document dozens of these types of paradoxical setups. Investors are taking almost any opportunity to do the opposite of what they’d normally be expected to do. If everyone in the market is a contrarian, is the true contrarian the non-contrarian? Heh – "Whaaaaat is the deeeeaal with contrarians?" Thanks, Jerry. If Georgie was running a hedge fund right now and abiding by his counterintuitive life strategy, he’d be absolutely killing it. George Costanza: "I tell you this, something is happening in my life. it’s all happening because I’m completely ignoring every urge towards common sense and good judgment I’ve ever had. This is no longer just some crazy notion. Jerry, this is my religion!" The January Merrill Lynch Fund Managers Survey showed very optimistic expectations from the majority of money managers. This is a sharp change from last months survey when fund managers were entering 2009 with cautious optimism. The latest survey showed the highest surge in Merrill’s Risk & Liquidity (46%) indicator since May of 2006. In the past, this indicator has served as a fairly good contrarian indicator. “This survey is one of the more bullish we have seen and suggests that investors buy into the idea that this recovery has legs,” said Gary Baker, head of European Equities strategy at BofA Merrill Lynch Global Research. “We are, however, seeing early signs that might alert contrarians looking for a selling opportunity – namely low cash allocations and possible complacency against a sell off in stocks,” said Michael Hartnett, chief Global Equities strategist at BofA Merrill Lynch Global Research. Who is the real contrarian these days? The Bears, who are dead right about how bad the economy is or the Bulls who are dead right for being long virtually every asset class, the riskier the better? Perhaps the true contrarian is neutral right now, refusing to play either the economic weakness or the markets’ strength. My head hurts. These are my favorite contrarian investing quotes, let me know if I missed any good ones.